Spanish - English Word Puzzle Book is a colourful, bilingual book arranged in 14 popular themes to teach young children new Spanish vocabulary. Practise first words in Spanish and English with crossword puzzles, word searches and other fun games. Handy picture clues will help you complete all the puzzles and there is lots of alphabet practice too. All the answers are given at the end of the book and there are also complete alphabetical Spanish-English and English-Spanish word lists. 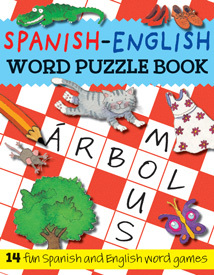 Spanish - English Word Puzzle Book is suitable for early language learning. As it is completely bilingual, it is suitable both for English-speaking children who are learning Spanish and for Spanish-speaking children who are learning English. This is brilliant! My daughter loves these sort of puzzles and we only do them in Spanish, which is a big help in her understanding.